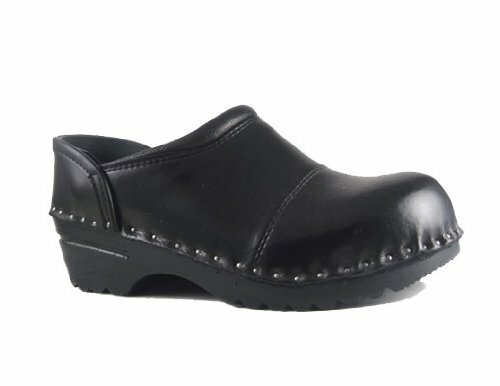 The Picasso Clog features a Safety Certified Steel Toe (ASTM F2412-05). Troentorp clogs have been handcrafted in the Bastad region of Sweden since our start in 1907. Our clogs feature an orthopedically constructed foot bed that supports even weight distribution with a soft step, helping reduce lower back strain and leg and foot discomfort. Shaped to exact measurements, the cowhide leather uppers are wet-lasted and use hand-hammered stainless steel nails to attach to the moisture-resistant alder wood foot bed, which has a raised heel and an anatomically correct scaphoid metatarsal arch and toe well. Each clog features a 1″ heat-bonded polyurethane sole and certified non-skid (ASTM 1677-Mark II) tread. Also featuring: Sustainably Made, Slip-Resistant (Non-Skid Certified ASTM 1677-Mark II), Steel Toe (Safety Certified Toe ASTM F2412-05)True to size. Wide foot or high instep? Consider a 1/2 size larger than your normal size.